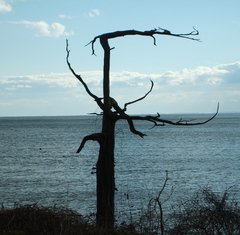 Last Thursday, Cherry and I set out to hike the final portion of the Menunkatuck Trail to Long Island Sound. We met at 1:00pm at Chittenden Park on Seaside Lane and headed north with one car to the trail head on Clapboard Hill Road. The entire route was along roads and, with snow recently, it was preferable to walk in the street when possible. It was about 40 degrees and sunny, but the initial section of street was rather busy and there were small shoulders. Cherry updated me on the almost completed status of her new garage, which was a huge relief for her. The Clapboard Hill section to Tanner Marsh Road, also known as Dudleytown (according to research done after returning home), had a host of historic homes. Cherry noted that one of them, dating from 1788, was quite similar to her house (1780). We turned down Tanner Marsh Road and were charmed by old farms and lovely homes and a much quieter neighborhood. Cherry spoke about coming to terms with being Alone, after significant loss in her life. She also whole-heartedly embraced her upcoming retirement in June, despite uncertainty about the future of her PEP program. We had an exchange about relationships and addressed that Alone concept again. We continued to Armster’s Spaceship, before turning down Sunset Lane to the park and our final destination, a view of Long Island Sound. Clearly Storm Sandy had wrecked havoc here, although the water was tranquil and hid its potentially destructive nature. We were charmed by some flowering forsythia en route and, after covering the final 3.68 miles in just over two hours, congratulated ourselves on completing yet another milestone — hiking the Menunkatucket Trail from start to finish. What will we do next? Find out next month (weather permitting).